Keep in mind that some of the most critical surfaces in machines are ferrous, and they generate ferromagnetic particles. The term ferromagnetic means the particles are attracted to magnets. Therefore, the ferrous (iron) debris that is generated can be picked up or removed from the oil for inspection. This should be done in cases where these types of particles are a concern. 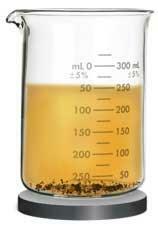 To perform the test, pull an oil sample from a live zone in the system and pour it into a glass beaker or flask. On the bottom of the beaker or flask, put a powerful flat (disk) magnet. You probably will need to add a little solvent like kerosene and mix it with the oil to get a nice low-viscosity mixture. Now, with the magnet held tightly on the bottom of the beaker or flask, slosh the mixture around for two or three minutes. The ferromagnetic particles will respond to the magnetic force and become pinned down on the bottom of the glass. You should be able to see a ring, which is called a ferrous wheel, because these are ferrous particles. You might want to take a picture of this ring so you can compare it to a standard scale based on its density and give it a numerical value. Without removing the magnet, pour out the liquid, leaving the particles behind. Some people like to pour the mixture into a funnel that has a membrane so the oil-solvent mixture is pulled through the funnel. On the surface of the membrane will be the nonferrous particles (aluminum, copper, tin, dirt particles, etc. ), or those that do not respond magnetically. Later, you can remove the magnet, pour in some more solvent and slosh it around. Now the particles will move loosely with the fluid. Finally, put a new membrane into your funnel and pour that mixture into the funnel. The ferrous particles will be on the surface of the membrane. You now have isolated these two types of particles and can put the membranes under a microscope for more detailed inspection. This oil analysis test and many other useful tests are taught in Noria's Oil Analysis Level II training course.